Not to be confused with Smörgåsbord. Rugbrød, butter, cold cuts, pieces of meat or fish, cheese, spreads, and garnishes. Smørrebrød (Danish pronunciation: [ˈsmɶɐ̯ˌbʁœðˀ]; originally smør og brød, "butter and bread") is a traditional Scandinavian open-faced sandwich that usually consists of a piece of buttered rye bread (rugbrød), a dense, dark brown bread, topped with commercial or homemade cold cuts, pieces of meat or fish, cheese or spreads, and garnishes. Bread is a very important part of the Scandinavian table, primarily rugbrød, which is sour-dough rye bread. It is a dark, heavy bread which is often bought sliced, in varieties from light-coloured rye, to very dark, and refined to whole grain. It forms the basis of smørrebrød, which is closely related to the Swedish smörgås. Some toppings are served on franskbrød (lit. "French bread"), a very light, crusty wheat bread. 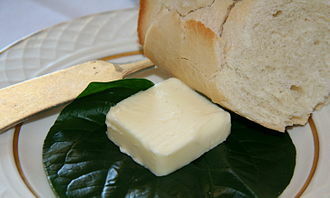 The bread is usually buttered, though for some variants, a spread of lard is customary. Traditional toppings include pickled herrings (plain, spiced or curried), slightly sweeter than Dutch or German herrings; thinly sliced cheese in many varieties; sliced cucumber, tomato and boiled eggs; pork liver-paste; dozens of types of cured or processed meat in thin slices, or smoked fish such as salmon; mackerel in tomato sauce; pickled cucumber; boiled egg, and rings of red onion. Mayonnaise mixed with peas, sliced boiled asparagus and diced carrot, called italiensk salat (lit. "Italian salad", so named because the colours match the Italian flag), remoulade or other thick sauces often top the layered open sandwich, which is usually eaten with utensils. It is custom to pass the dish of sliced breads around the table, and then to pass around each dish of toppings, and people help themselves. 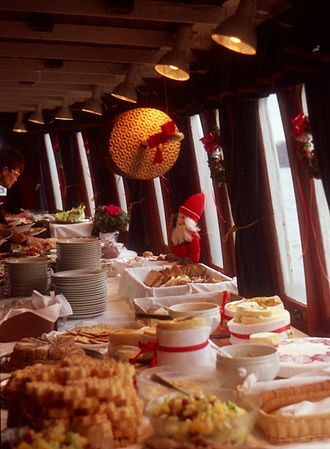 More festive meals can be loosely divided into courses: Fish toppings first (such as herring, shrimp, or smoked salmon) followed by cold cuts and salads, and finally cheese with bread or crackers and a little fruit. One or several warm dishes are often served with the meats on special occasions, for example: breaded plaice filet, fried medister sausage, frikadeller with pickled red cabbage, or mørbradbøf (pork tenderloin with sauteed onions or a creamy mushroom sauce). 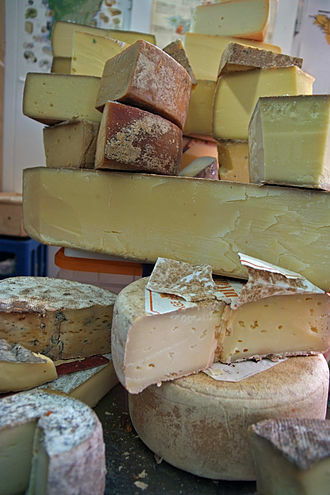 Toppings change with the seasons and some are mostly associated with Easter or Christmas lunches, like head cheese and æbleflæsk (lit. "apple pork", roast pork or bacon in apple sauce). Summer offers lighter fare such as smoked mackerel, sommersalat (lit. "summer salad", radish and cucumber in a smoked cheese dressing), new potatoes, and freshly peeled shrimp. Dyrlægens natmad (Danish: Veterinarian's midnight snack) — on a piece of dark rye bread, a layer of liver pâté, topped with a slice of salt beef and a slice of meat aspic. This is all decorated with raw onion rings and garden cress. Eel — smoked eel on dark rye bread, topped with scrambled eggs and sliced radishes or chopped chives. Leverpostej — warm rough-chopped liver pâté served on dark rye bread, topped with bacon, and sauteed mushrooms. Roast beef — thin sliced and served on dark rye bread, topped with a portion of remoulade, and decorated with a sprinkling of shredded horseradish and toasted onion. Roast pork — thin sliced and served on dark rye bread, topped with red sweet and sour cabbage, and decorated with a slice of orange. Salmon — slices of cold-smoked salmon or gravlax (cured salmon) on white bread, topped with shrimp and decorated with a slice of lemon and fresh dill. Spiced meat roll - thin sliced and topped with meat aspic, raw onion rings and garden cress. Stjerneskud (lit. "shooting star") — on a base of buttered white bread, two pieces of fish: a piece of steamed white fish on one half, a piece of fried, battered plaice on the other half. 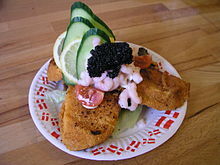 On top is piled a mound of shrimp, which is then decorated with a dollop of mayonnaise, red caviar, and a lemon slice. Tartar — raw lean beef mince with salt and pepper, served on dark rye bread, topped with raw onion rings, grated horseradish and a raw egg yolk. A lavish piece of restaurant smørrebrød can almost be a meal unto itself, whereas everyday toppings are much simpler and often ungarnished. ^ "Word origin of 'smørrebrød'". Collins Dictionary. ^ Stanley Mills Hagart, Darwin Porter (1979). Scandinavia on $20 a day. p. 20. Katrine Klinken, Smørrebrød – Danish open, Thaning & Appel, 2008. Ida Davidsen and Mia Davidsen, Open your heart to the Danish open – : the Davidsen dynasty and their best recipes, Lindhardt og Ringhof, 2006. ISBN 978-87-614-0400-8. Inge Lotz, Danish open sandwiches, Aschehoug Fakta, 1997. ISBN 87-7512-668-0. Wikimedia Commons has media related to Smørrebrød. Mayonnaise is a thick, creamy dressing often used as a condiment. It is an emulsion of oil, egg yolk, and either vinegar or lemon juice, with many options for embellishment with other herbs. 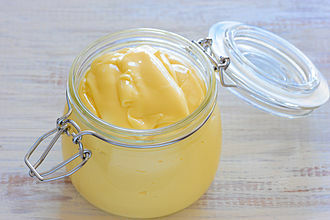 Proteins and lecithin in the egg yolk serve as emulsifiers in both mayonnaise and hollandaise sauce, commercial egg-free alternatives are available for vegans and others who want to avoid animal products and cholesterol, or who are allergic to eggs. 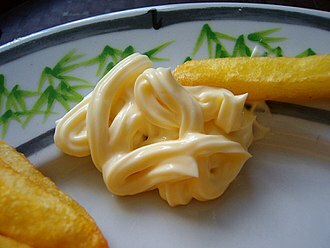 Mayonnaise varies in color, but is white, cream. It may range in texture from that of light cream to a thick gel, the word mayonnaise was not used for a dressing before the start of the 19th century. The earliest reference appears to be by Alexandre Viard, who never quite gives a recipe for the dressing itself. At that point, the sauce was made with aspic or jelly, in 1815, Louis Eustache Ude wrote, No 58. —Mayonnaise. Take three spoonfuls of Allemande, six ditto of aspic, and two of oil, add a little tarragon vinegar, that has not boiled, some pepper and salt, and minced ravigotte, or merely some parsley. Then put in the members of fowl, or fillets of soles and your mayonnaise must be put to ice, neither are you to put the members into your sauce till it begins to freeze. Next dish your meat or fish, mask with the sauce before it be quite frozen, and garnish your dish with whatever you think proper, as beet root, nasturtiums, &c. In a 1820 work, Viard describes something like the more familiar emulsified version, This sauce is made to take in many ways, with raw egg yolks, with gelatine and this sauce is used for cold fish entrees, or salad of vegetables cooked in salt water. According to this version, the sauce was known as salsa mayonesa in Spanish and maonesa in Catalan. The Larousse Gastronomique suggests, Mayonnaise, in our view, is a corruption of moyeunaise, derived from the very old French word moyeu. It is highly probable that wherever olive oil existed, a preparation of oil and egg came about — particularly in the Mediterranean region. According to the Oxford English Dictionary, the term mayonnaise was in use in English as early as 1823 in the journal of Lady Blessington, traditional mayonnaise is a mixture of egg, vinegar and spices. A mushroom is the fleshy, spore-bearing fruiting body of a fungus, typically produced above ground on soil or on its food source. These gills produce microscopic spores that help the fungus spread across the ground or its occupant surface, by extension, the term mushroom can designate the entire fungus when in culture, the thallus of species forming the fruiting bodies called mushrooms, or the species itself. Identifying mushrooms requires an understanding of their macroscopic structure. Their spores, called basidiospores, are produced on the gills, at the microscopic level the basidiospores are shot off basidia and fall between the gills in the dead air space. As a result, for most mushrooms, if the cap is cut off and placed gill-side-down overnight, the color of the powdery print, called a spore print, is used to help classify mushrooms and can help to identify them. 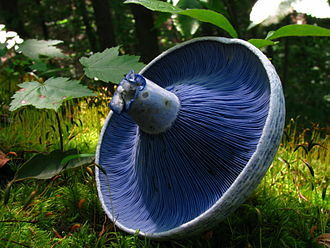 Spore print colors include white, black, purple-brown, pink and creamy, but almost never blue, green, or red. The presence of juices upon breaking, bruising reactions, tastes, shades of color, habit and smelling mushrooms carries its own hazards because of poisons and allergens. Chemical tests are used for some genera. In general, identification to genus can often be accomplished in the using a local mushroom guide. However, over-mature specimens lose features and cease producing spores, many novices have mistaken humid water marks on paper for white spore prints, or discolored paper from oozing liquids on lamella edges for colored spored prints. Typical mushrooms are the bodies of members of the order Agaricales, whose type genus is Agaricus and type species is the field mushroom. Other mushrooms are not gilled, so the mushroom is loosely used. 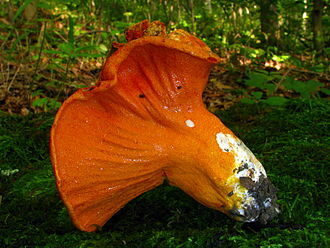 Some have pores underneath, others have spines, such as the mushroom and other tooth fungi. Mushroom has been used for polypores, jelly fungi, coral fungi, bracket fungi, thus, the term is more one of common application to macroscopic fungal fruiting bodies than one having precise taxonomic meaning. Approximately 14,000 species of mushrooms are described, the terms mushroom and toadstool go back centuries and were never precisely defined, nor was there consensus on application. Aspic is a dish in which ingredients are set into a gelatin made from a meat stock or consommé. Non-savory dishes, often made with commercial gelatin mixes without stock or consommé, are usually called gelatin salads, when cooled, stock that is made from meat congeals because of the natural gelatin found in the meat. The stock can be clarified with egg whites, and filled and flavored just before the aspic sets, almost any type of food can be set into aspics. Most common are meat pieces, fruits, or vegetables, aspics are usually served on cold plates so that the gel will not melt before being eaten. A meat jelly that includes cream is called a chaud-froid, nearly any type of meat can be used to make the gelatin, beef, chicken, turkey, or fish. The aspic may need additional gelatin in order to set properly, veal stock provides a great deal of gelatin, in making stock, veal is often included with other meat for that reason. 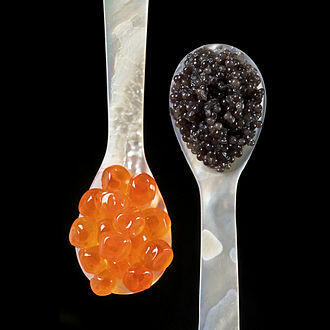 Fish consommés usually have too little natural gelatin, so the stock may be double-cooked or supplemented. Since fish gelatin melts at a lower temperature than gelatins of other meats, fish aspic is more delicate and fish stocks need gelatin to maintain a molded shape. Historically, meat aspics were made before fruit- and vegetable-flavored aspics or jellies, by the Middle Ages at the latest, cooks had discovered that a thickened meat broth could be made into a jelly. A detailed recipe for aspic is found in Le Viandier, written in or around 1375, in the early 19th century, Marie-Antoine Carême created chaud froid in France. Chaud froid means hot cold in French, referring to foods that were prepared hot, Aspic was used as a chaud froid sauce in many cold fish and poultry meals. The sauce added moisture and flavor to the food, Carême invented various types of aspic and ways of preparing it. Aspic, when used to hold meats, prevents them from becoming spoiled, the gelatin keeps out air and bacteria, keeping the cooked meat fresh. Aspic came into prominence in America in the early 20th century, by the 1950s, meat aspic was a popular dinner staple throughout the United States as were other gelatin-based dishes such as tomato aspic. Frikadeller are flat, pan-fried meatball of minced meat, often likened to the Danish version of meatballs. In Sweden, poached quenelles are called frikadeller and are served in soup. In Hungary, it is called fasírt and often accompanies the Hungarian stew type and they are pan-fried in pork fat or beef fat, or more commonly in modern times in butter, margarine or even vegetable oil. Another popular variation is fiskefrikadeller replacing the meat with fish as the main ingredient, as a main dish they are most often served with boiled white potatoes and gravy accompanied by pickled beetroot or cooked red cabbage. Alternatively they can be served with creamed, white cabbage, Frikadeller are a popular choice on the Smörgåsbord or Swedish lunch buffet, eaten on rugbrød with red cabbage or pickle slices. They can be served cold, sliced thinly as a base for open face sandwiches on rye bread, the combination of frikadeller and a cold potato salad is very popular at picnics or potlucks, due to the ease of transporting either component after cooking. Cabbage or headed cabbage is a leafy green or purple biennial plant, grown as an annual vegetable crop for its dense-leaved heads. It is descended from the cabbage, B. oleracea var. oleracea. Cabbage heads generally range from 0.5 to 4 kilograms, smooth-leafed firm-headed green cabbages are the most common, with smooth-leafed red and crinkle-leafed savoy cabbages of both colors seen more rarely. Under conditions of long sunlit days such as are found at high latitudes in summer. 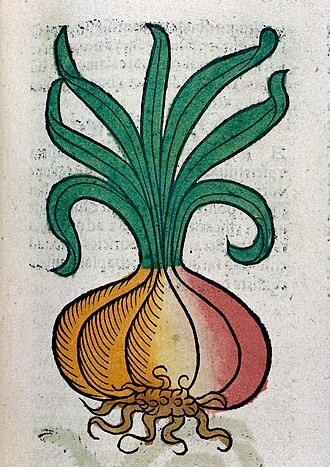 Some records are discussed at the end of the history section and it is difficult to trace the exact history of cabbage, but it was most likely domesticated somewhere in Europe before 1000 BC, although savoys were not developed until the 16th century. By the Middle Ages, it had become a prominent part of European cuisine, cabbage is prone to several nutrient deficiencies, as well as to multiple pests, and bacterial and fungal diseases. The Food and Agriculture Organization of the United Nations reports that production of cabbage. Almost half of these crops were grown in China, where Chinese cabbage is the most popular Brassica vegetable, cabbages are prepared in many different ways for eating. They can be pickled, fermented for dishes such as sauerkraut, stewed, sautéed, cabbage is a good source of vitamin K, vitamin C and dietary fiber. Contaminated cabbage has been linked to cases of illness in humans. Cabbage is a member of the genus Brassica and the mustard family, several other cruciferous vegetables are considered cultivars of B. oleracea, including broccoli, collard greens, brussels sprouts and sprouting broccoli. All of these developed from the wild cabbage B. oleracea var. oleracea, the varietal epithet capitata is derived from the Latin word for having a head. B. oleracea and its derivatives have hundreds of names throughout the world. Cabbage was originally used to refer to forms of B. oleracea. A related species, Brassica rapa, is commonly named Chinese, napa or celery cabbage and it is a part of common names for several unrelated species. An open sandwich, known as an open face/faced sandwich, bread baser, or tartine consists of a single slice of bread with one or more food items on top. During the Middle Ages, thin slabs of coarse bread called trenches or, in its French derivative, at the end of the meal, the food-soaked trencher was eaten by the diner, or perhaps fed to a dog or saved for beggars. Trenchers were as much the harbingers of open face sandwiches as they were of disposable crockery and these explanatory specifications reveal the Dutch belegd broodje, open-faced sandwich, was as yet unfamiliar in England. The American tongue toast is offered as an entrée for breakfast, lunch, in Finland the sandwich is called voileipä, and in Estonia similarly võileib, which means butter bread. This is typically complemented by some herbs and vegetables such as parsley, cold salad, thinly sliced cucumber, a condiment, such as mayonnaise, or mayonnaise-based dressing is often included in some form. An old traditional replacement for butter on a piece of bread with herring is pig fat, there are many variations associated with the smørrebrød/smørbrød/smörgås and there are even special stores, cafés and restaurants that specialize in them. The Dutch and Flemish Uitsmijter consists of one or more slices of bread topped with fried eggs, the dish is often served as a hearty breakfast. Sweet toppings are commonly used for breakfast in the Netherlands and Belgium, e. g. sprinkles, vlokken, or muisjes, next to the more widespread peanut butter, jam, in Great Britain, open sandwiches are rare outside of Scandinavian delicatessens. However, this is not considered a sandwich, in North America an open faced sandwich may refer to a slice of bread topped with warm slices of roasted meat and gravy. Examples include a beef Manhattan, a hot sandwich in Canada. This is done in Scandinavian countries, where they eat open faced sandwiches with fried meat and fried fish. 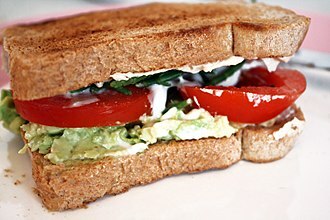 The term sandwich is used in reference to open-faced sandwiches. The open-faced sandwich has a history, originating between the 6th and 16th centuries, whereas the modern sandwich traces its roots to the Earl of Sandwich. In the court case in the United States of White City Shopping Ctr, L.
Bacon is a meat product usually prepared from pork and cured. It is first cured using large quantities of salt, either a brine or a dry packing, fresh bacon may be dried for weeks or months in cold air, or it may be boiled or smoked. Fresh and dried bacon are typically cooked before eating, often by frying, boiled bacon is ready to eat, as is some smoked bacon, but they may be cooked further before eating. 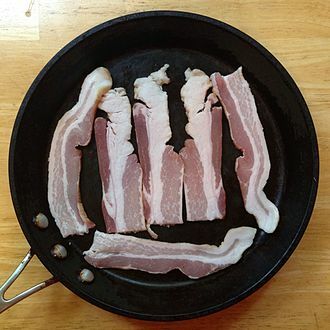 Bacon is prepared from different cuts of meat. It can be made from side and back cuts of pork, a side cut has less fat than the belly. In the United States, the term implies belly bacon, with leaner cuts known as Canadian bacon, in the United Kingdom, loin bacon with some belly attached is known as back bacon, or rashers, and belly bacon is called streaky bacon. Bacon may be prepared from one of two distinct back cuts, which is almost pure fat, or pork loin, Bacon may be eaten smoked, fried, baked, or grilled. 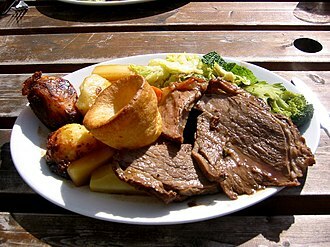 It is eaten on its own, as a side dish, Bacon is used for barding and larding roasts, especially game, including venison and pheasant. The word is derived from the Old High German bacho, meaning buttock, ham or side of bacon, in Italy, this product is called pancetta and is usually cooked in small cubes or thinly sliced as part of an antipasto. Meat from other animals, such as beef, chicken, goat, or turkey, may be cut, cured, or otherwise prepared to resemble bacon, and may even be referred to as bacon. Such use is common in areas with significant Jewish and Muslim populations, the USDA defines bacon in the American way as the cured belly of a swine carcass, and other cuts and characteristics must be separately qualified. For safety, bacon may be treated to prevent trichinosis, caused by Trichinella, Bacon is distinguished from salt pork and ham by differences in the brine or dry packing. Bacon brine has added curing ingredients, most notably sodium nitrite, and occasionally potassium nitrate, flavourings such as brown sugar or maple syrup are used for some bacon products. Sodium polyphosphates, such as sodium triphosphate, may be added to make the easier to slice. An aspic with chicken and eggs. Positioning eel traps in Inle Lake (Myanmar).